A beautifully inspiring home water birth story. Click "Read More" to view the video and read the full story. I open the door in the still of a snowy March night and hear the sounds, the powerful sounds that I instinctively recognize as the moment of birth. It has been only 25 minutes since I received the call that, despite the contractions still remaining widely spaced, the intensity was picking up. I quickly remove my shoes and race down the stairs. As I set down my bags, I hear the wail of a fresh new baby as daddy smiles and announces that the little one has arrived. I spring into action as the emotions of this stunningly fast experience begin to sink in for the family. It happened so quickly, the midwife hasn't arrived, and the cord has broken. Daddy passes the new baby boy to his mother, and after some quick reassurance over the phone from the midwife, who is on her way, the family is able to relax for a moment and take in their newest addition. This momma knew that it would happen in the middle of the night, and that it would happen fast, but it is still so much to comprehend at this moment. As her face relaxes from panic to love and pride, the atmosphere in the room is that of utter peace. The new babe is so calm in the arms of his mother, and latches on for his first meal without hesitation. Daddy has been such an impressive source of calm and support. He is clearly so very proud of his wife and the gift that she has given him this morning. A very proud abuela looks on, clearly so amazingly proud of her daughter’s strength and power. The arrival of their midwife is greeted with a great sense of relief. At last, momma is able to get up and out of the pool and tidied up, and her and baby are able to get some warm snuggles and another nursing. Names are discussed, phone calls are made, and baby David is weighed (8lbs, 10oz - only 2 ozs shy of momma's guess) and measured. He is, of course, a perfect 10 in every way. 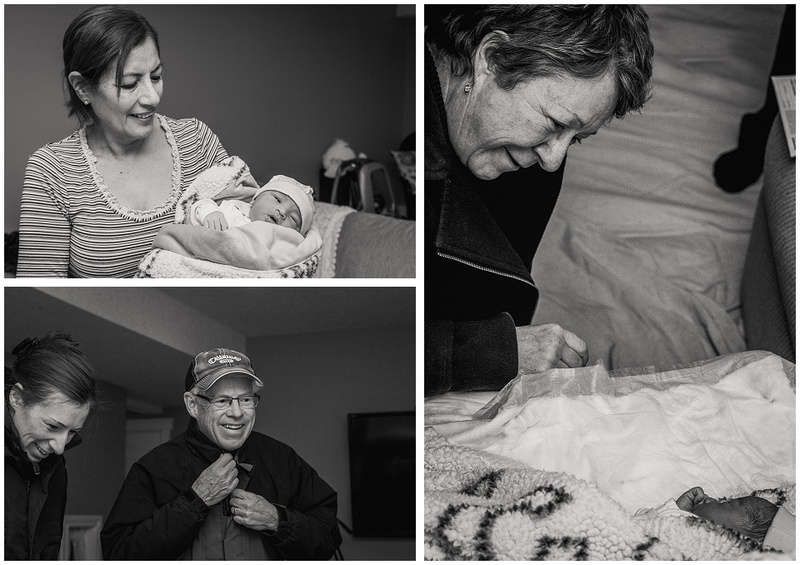 His abuela takes David to be dressed and swaddled up to meet some more of the family. It may have taken a bit to get grandad up from his slumber at this time of the morning, but moments later he arrives with David's grandmother and auntie. They are beaming with joy as they set eyes on the new little one, gushing compliments and noting the similarities to big sister and brother. The room is alive with love and delight, and despite the hour now approaching 4:00, with very little sleep, we are all wide awake with the excitement. The family says their goodbyes and mother and her baby are settled in for a much needed rest. I too, retire for a few hours before our fresh baby session later that morning as the siblings meet their newest baby brother. What an amazing honour it has been to be welcomed in to the sanctity of this birth, and how proud I am to have created the images that will preserve every loving moment. 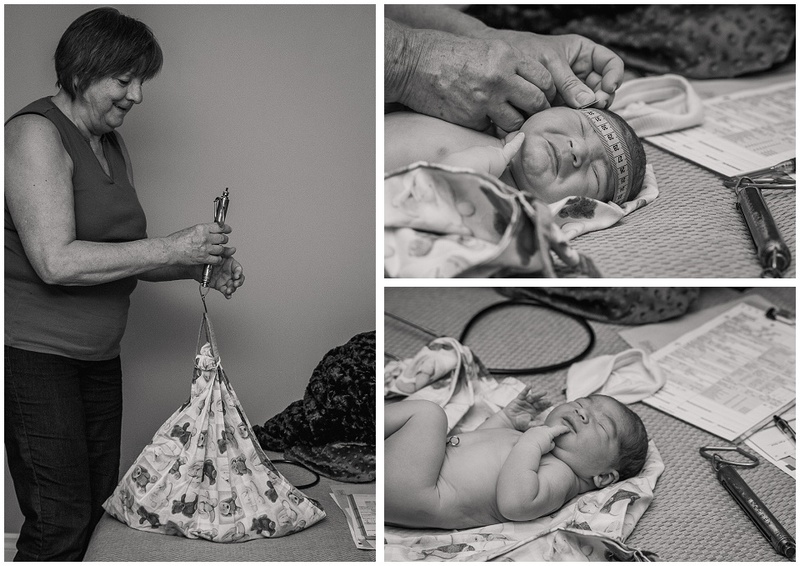 Stay tuned to the blog for images from the fresh baby session to follow.